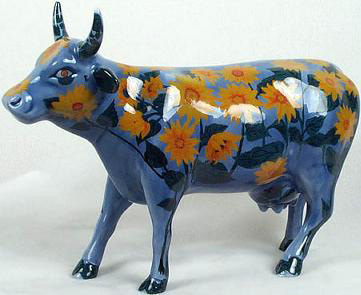 Moo-Nay's Garden | CowParade New Figurines | One Price Low Flat Shipping! From the CowParade Retired Cows Collection, Moo-Nay's Garden. Featured at CowParade Kansas City 2001 exhibit. Made of Ceramic. Measures 4" x 6"
This floral artist cow is a recreation of Claude Monet's famous painting of sunflowers against a soft blue background.